Paso Underground opened in August 2013 designed to bring together like-minded winemakers by establishing a collective wine tasting venue right in the heart of Paso Robles. Currently the tasting room features four small production wineries whose passion trails their wines from the vine to the bottle. Each winery offers a selection of different varietals from Paso Robles and the surrounding area. 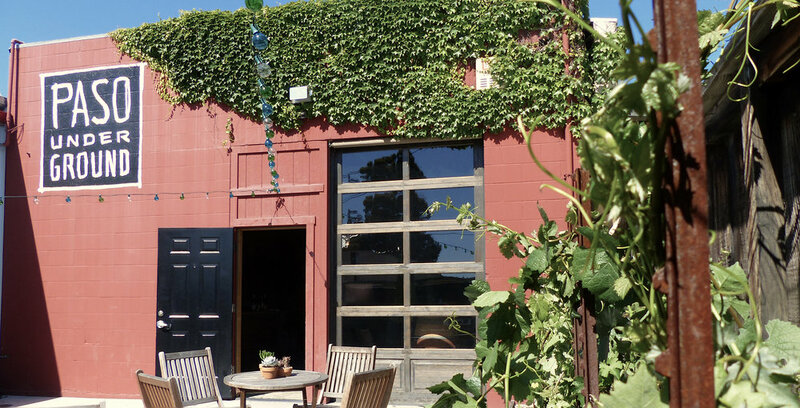 The tasting room gives visitors not only the chance to get to know the unique terroir of Paso Robles but also sip the wine with the winemaker in person. The wine tasting is a laid-back experience. Tasting fees are $10 - 15 and the fee is refundable if you purchase wine. The wines are also available to be purchased by glass or full bottle and can be enjoyed in the back patio. Recently, I’ve made myself known here in Paso Robles for making a particularly elegant style of Rhone wines, especially whites. I relish the challenge of applying a little bit of restraint to the opulent and sometimes obnoxious wines that the Paso Robles terroir seems to produce. But I also love working outside the boundaries of elegance and refinement (enter Carignan…) in order to make some truly unique and remarkable wines. In other words, I like to play. Copia Vineyards, is a small vineyard project located in the Willow Creek Appellation among the scenic hills on the west side of Paso Robles. Copia, named for the Roman Goddess of Abundance, is a perfect expression of what owners Varinder Sahi and Anita Kothari were seeking when they found the land in 2017. The calcareous soil and steep slopes make it an ideal place to grow premium fruit for the world-class Rhone style wine they so love. In 2011, two acres of Grenache, Syrah and Mourvèdre were planted on the property and this estate fruit, along with premium fruit from Copia’s neighbors make up the wines. Current offerings are available at Paso Underground tasting room and at copiavineyards.com. Founded in 2012, Lost Blues is a vision made real by two hands, a strong back, and the help of many friends. My winding path has been rocky and yet somehow that makes the reward of it all the better. There’s no place like California’s Central Coast. Paso Robles is home. There’s a humility here that honors her natural beauty. Lost Blues is a tribute to this place, and I feel fortunate to share the fruits of my labor with you. Riley Hubbard’s journey as a winemaker spans all corners of the world and her wines are a reflection of a myriad of influences, education, and experience. Born and raised in San Diego, Riley received a degree in Ag Business with a minor in Viticulture from Cal Poly, San Luis Obispo. During her time at Cal Poly, she began her career in wine in Paso Robles at L’Aventure Winery under the tutelage of rogue winemaker Stephan Asseo. From working the tasting room, harvest production, to vineyard work, Hubbard immersed herself in the boutique winery’s lifestyle and lived on the property for a few years. Thank you for your message we will respond as soon as possible.